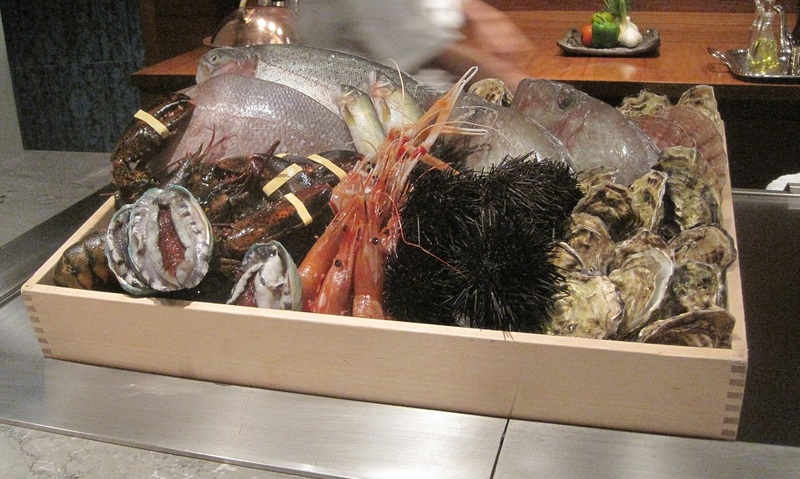 Today’s entry is our dinner at Waku Ghin, Tetsuya Wakuda ’s Singaporean outpost. This was truly a memorable evening for us for a number of reasons. Firstly, this was a meal to celebrate our marriage just a few days ago. Also Tetsuya is my culinary idol (unfortunately I have not had the opportunity to meet him as he has never been at his restaurants each time I have dined) and we were going to Singapore as a stopover on our honeymoon, so Waku Ghin was a perfect excuse to splurge on a mind blowing meal. And as you will see, this was one of the best meals that we had ever eaten. Tetsuya, of course, needs no introduction. He is a legend in Australia. Tetsuya’s (in Sydney) has won too many awards and was long regarded the best restaurant in Australia. What fascinates me about Tets is that he is a very humble man that has been able to pass on his gift to other trained great chefs who have worked under him and have then gone on to open highly successful restaurants (e.g. Martin Benn at Sepia). Waku Ghin is Tetsuya’s first venture outside of Australia. It opened in late 2010 and is a part of the Marina Bay Sands complex. The gaming floor is below Waku Ghin, quite the contrast to the beautiful dining rooms through the Waku Ghin doors. The restaurant is huge at 929 square metres, has long hallways, several dining rooms and kitchens. However Waku Ghin caters for just twenty-five people per seating and with two seatings per night. I have heard that there are more staff here than customers. As people who know me can attest, I plan my holidays around food. So I made the reservation way before I booked any flights. Of course Waku Ghin has had much success since it has opened and is considered to be one of the best (if not the best) restaurants in Singapore. It has been ranked as the second best restaurant in Asia in the 2012 Miele Guide and ranked number 39 in the world in the S.Pellegrino World’s 50 Best Restaurants in its debut year in 2011. Although there may be debate as to what is the best restaurant in Singapore (the other contender being Iggy’s), Waku Ghin certainly holds the title of most expensive menu, weighing in at SGD$400 per person for the degustation only menu. As we entered the restaurant, we were greeted warmly by staff and taken to our private Teppanyaki room, complete with our own personal chef. One thing that I still remember vividly is how good the service was and how friendly the staff were. I had never encountered anything like this back in Sydney. I suppose they should treat their customers like royalty at these prices! I had this oyster course as my first course. This was an amazing way to kick off the meal! The oyster was nice and plump and of course delicious. Underneath was a soft, wobbly egg custard that was to die for! This was my wife's first course. She loved it! It was beautifully cooked and wonderfully sweet. This is the signature dish at Waku Ghin and it is simply sensational! I would say it is better than the other (much more famous) Tetsuya signature dish at his Sydney restaurant, the confit of ocean trout. The presentation is just beautiful. Loved the way it was served in the hollowed out sea urchin shell. The flavours and textures in this dish are just so refreshing and amazing. Everything just worked so well together. The saltiness of the caviar is a perfect compliement for the rich, creamy sea urchin and the beautiful prawns. This was my favourite course in a meal of many highlights! My wife's second course. Unfortunately for her, she is a vegetarian so she does not realise what she is missing out on with all the beautiful seafood that I am having hehe. However this was an awesome soup indeed! So refreshing and tasty. Waku Ghin provides a much different offering with the Petuna ocean trout compared to the confit of ocean trout in the Sydney restaurant. Whilst this was a very capable dish in its own right and was delicious, this does not compare to the confit of ocean trout. This version is probably geared more towards the Asian palate. The maitake mushrooms were from Japan. The mushrooms were expertly cooked right in front of our eyes on the teppanyaki grill and finished off with yuzu salt, which gave a nice citrus hit to the dish. This was the first of a few courses that were cooked on the teppanyaki grill. Watching the chef do his thing was one of the highlights of the experience! It certainly made for a theatrical (and entertaining in my view being a foodie) outing. Just delicious! I love miso. The soup was refreshing and had great flavour. Awesome tempura! Great produce, and wonderfully light, crisp tempura batter. The abalone was another dish that was cooked at the teppanyaki grill. The chef makes it look so easy. The abalone was grilled to perfection, allowing the meat to become tender whilst maintaining a slight chewiness. The abalone was served with polenta, cherry tomatoes and a delicious garlic cream. This was my wife's favourite course and I can see why! This dish contains all three of wife's favourite things to eat: potato, egg and truffle. The potato puree was so smooth and creamy. The egg had a beautiful warm, gooey yolk. The slices of truffle were shaved right in front of us and there was so much truffle! Simply exquisite! This was an amazing course! The broth was a lobster bisque with tarragon and butter, which was cooked in front of me on teppanyaki grill. The lobster is slowly braised within, which makes the lobster really moist and juicy and gives it great flavour. We don't remember much about the daikon. This was the least memorable course in the vegetarian menu. The rolls of wagyu beef were grilled on the teppanyaki grill only for a few minutes and served with garlic chips, shaved spring onion, fresh wasabi, and a side of sweet citrus soy. The beef was sooooo very good! It was almost perfect and melted in my mouth. Only problem was I got two rolls. And I love fresh wasabi, something that I rarely get the opportunity to have. It has much more complex layers of flavour when comapred to typical packet wasabi. My wife was presented with a sauteed white asparagus, which was from France, Girolle mushrooms and a roasted whole onion, which was topped with paremesan. My wife enjoyed the asparagus and the mushooms however, as she doesn't like eating whole onions, she didn't have it. So I happily ate the onion and it was yum! Nicely caramelised and sweet onion with melted paremesan makes for great flavour. To finish off my savoury courses, I had some rice and hirame, which is a type of flounder. This was all immersed in a chicken consomme. The consomme was delicious and very clean and went very well with the fish. What a great way to finish off the savoury courses! This was my wife's last savoury course and she loved it! Lovely grilled zucchinis on a bed of rice. Before dessert, we were each served a cup of gyokuro from Kyoto, which is an expensive green tea. The tea had quite strong flavours that I found interesting. It was slightly bitter and I could taste a hint of saltiness. For desserts, we went to another room with views of the water and it was just amazing! The granita was just so refreshing and a perfect palate cleanser. The flavours were just amazing! The Ghin cheesecake was laced in front of me and when I looked down I was like "Ummm, ok, I think they might have misunderstood my instructions"! When I made the reservation I asked the restaurant to deliver a message to my wife to celebrate our recent wedding. They must have thought otherwise... Any way, I will happily take the Gihn cheesecake because it was divine and one of the best cheesecakes I have had! The cake was light and airy and have I loved the citrus notes from the lemon curd. So moments later, the waiter takes out this chocolate mousse cake and places it in front of my wife. So it appears that they did get my message and understand it, so I don't know where the "happy birthday" message came from! Whatever, maybe they knew my birthday was in just over a week's time so they wanted to give me an early birthday present, LOL! This was a very very yummy chocolate mousse. Rich, yet not heavy. Velvety in texture. The chocolate was to die for! Chocolate lover would be in paradise if served this dessert. What a wonderful meal! We were too full to have the petite fours so the waiter packed it away for us in a nice little box and they also gave us a copy of the menu to take home. Dinner at Waku Ghin was truly a once in a lifetime experience that we will treasure for the rest of our lives! Highlight: The signature dish, Marinated Botan Ebi with Sea Urchin and Oscietre Caviar, is to die for! Lowlight: There were really no lowlights. Eating at Waku Ghin was easily the most expensive meal I have ever had so it is not cheap. But it was very special indeed!